Description: County map of Surrey with insets of Nonsuch and Richmond Palaces. Based on the survey by John Norden and the first atlas map of the county. First edition. Description: Nymphs and other figures from Polyolbion. Description: Rare miniature map of Surrey from the first set of English county maps to include longitude and latitude markings. Fewer than 200 copies of this map are thought to have been published. Description: Attractive county map of Surrey with a key to its hundreds and other notable features. London can be seen in the upper right. Description: Charming county map of Surrey with attractive cartouche. Coloured. Description: Elegant, detailed and accurate map of Surrey. The first county map to shed the 16th-century geography of Christopher Saxton. Original colour. Description: Elegant county map with compass rose cartouche. Original colour. Description: First edition of this extremely rare folding wall map of Surrey from a survey done in 1789-90. Original colour. Folded. Description: Attractive county map of Surrey by the cartographer to the Postmaster General, accurately plotting England's roads. Original colour. Description: Bagshott to Windsor Park. Road map. Original colour. Description: Attractive map of the county of Surrey highlighting the developing road network during the Industrial Revolution. Original hand colour. 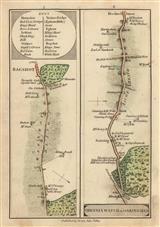 Description: Separately issued folding map of Surrey with a charming vignette of Empsom Race Course on the upper left. Original hand colour. Folded. Description: Surrey, divided into hundreds and with elegant vignette of the races at Epsom. Original colour. Description: Large scale folding wall map of Surrey with a large vignette of Kew Palace on the upper left. Original colour. Folded. Description: Glorious folding wall map of Surrey on four sheets based on a new survey by Bryant performed in 1822-3. Proof copy. Extraordinary original hand colour. Folded.